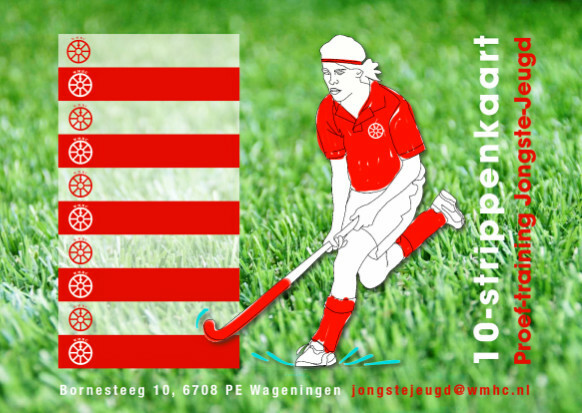 WMHC, located at Sportpark De Bongerd in Wageningen, has about 1000 members (about 700 juniors, 300 seniors). WMHC offers several memberships, depending on your wishes. Within the senior section about 25% is recreational (only training and trim hockey). About 300 seniors have a full membership and play matches each Sunday (September-June, excluding winter). All members have the opportunity to join practice sessions once or twice a week. Juniors practice mostly in the afternoon. Older juniors and seniors practice in the evening. Competition matches are played on Saturday (Juniors) or Sunday (Seniors). One ladies team plays on Tuesday mornings. During summer, WMHC senior members actively get together on Thursday night for some recreational hockey. The WMHC match outfit consists of red shirt with white pants/skirt and red socks. Teams are given a team kit at the beginning of each season; full members do not need to buy this kit, but pay a special fee each year. WMHC offers a special Student Membership. Students get a discount if they are registered at a Dutch (Educational) institution of higher or university educational level (such as Van Hall Larenstein or WUR). A copy of registration of one of the institutes must be giving upon registration. The discount does NOT apply to AIO's and PhD students. Only in Wageningen for a shorter period? Get in touch with us and we will offer you a shorter membership, with a corresponding membership fee. For any questions regarding membership at WMHC: [email protected]. At WMHC we believe that each member could help to make WMHC a great place for hockey and social events. If you are interested to help in one way or another, let us know by sending an email to [email protected]. For more information or if you have any questions feel free to contact us at [email protected].